Sauber spent their time at Jerez utilising a very basic aero configuration, mostly doing shakedown work that checked systems and most importantly allowed the team and drivers to understand the new powerunit. The Front Wing has been an area that the Sauber team have followed their own development path with over the last few seasons, often sporting winglets, cascades and endplates with a different ethos to their opposition. The team arrived in Jerez with a Front Wing that seemingly converged on their own design mated to a fairly conventional Endplate design (See top right inset). 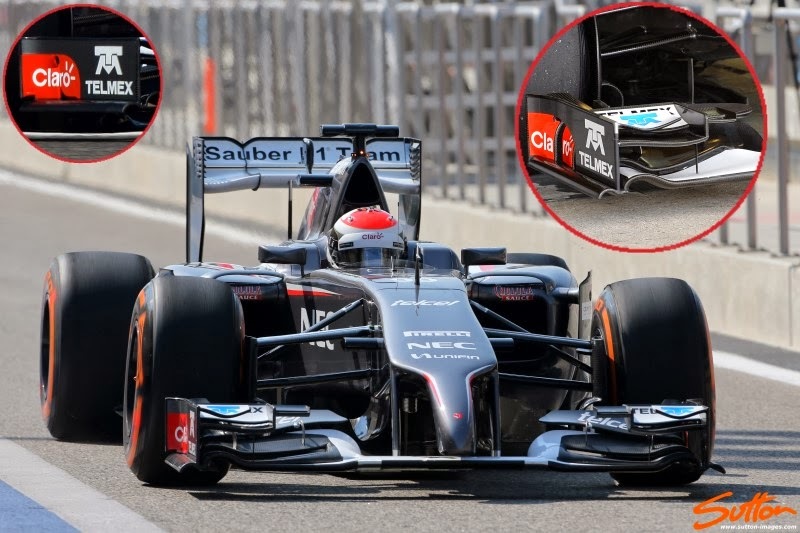 In Bahrain the team arrived with a whole new Front Wing that not only saw a change in Endplate ethos (Endplate extended to cover the inboard flap section, see smaller inset on the left) but also a change to the Mainplane. In order to make the Mainplane more efficient over a wide speed range Sauber have added an additional slot running from the most outboard section of the wing to where it meets with the Y250. This lower slot also means that the Wing either side of the Y250 sits ever so slightly lower engaging the airflow as it passes over and under the Wing.